Sixty metres down the dirt road past the new bridge, Natural Bungalows offers a flashier stay than the name suggests. Ad Book now! Rates from US$41++. Average rating 7.6 from 293 reviews. 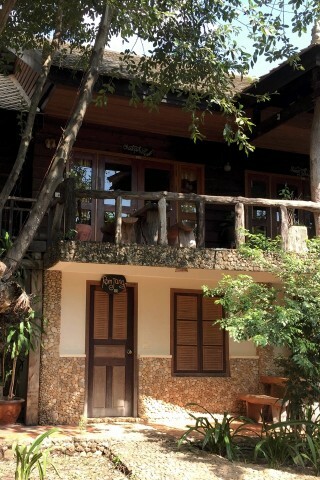 Quality guest rooms are spread throughout wooden houses arranged in a large tropical garden with butterflies and fruit trees, making this a great family or couples stay. A shady bar and restaurant faces onto the river with views to Bokor mountain, and the resort also has its own mini beach, complete with lounging areas and a basketball hoop. It’s not quite the laidback away-from-it-all vibe that you’ll find further up the river, but it’s more convenient for shopping and evenings in town, and a free tuk tuk shuttle service is provided. The well-sized rooms are distinctively decorated in shades of green and pink, with kitsch Khmer touches such as apsara paintings and pebble-finished bathrooms. If you’re a light sleeper, try for a room furthest away from the bridge. A basic breakfast and WiFi are included in the price, but the rooms lack fridges or kettles. Service was very friendly and endeavouring to be helpful, though could be a little haphazard. We get the feeling that some of the staff here would give you the shirt off their own back if they thought it would help you out. We were uniformly quoted $50 for every room that we were taken to see (four altogether). We felt that might be a little over-priced compared to their peers, but then it is very convenient to town, and you’re unlikely to trip over stoners on the way in either. Check rates at Natural Bungalows on Booking.com.